Michael Davis presenting his Master’s thesis. 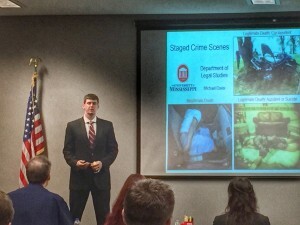 Michael Davis, a Criminal Justice graduate student, took part in the Three Minute Thesis event presented each year by the University of Mississippi’s graduate school. The Three Minute Thesis is a research communication competition developed by the University of Queensland, Australia. The exercise challenges higher degree students to present a compelling oration on their research thesis topic and its significance in just three minutes and allows them to use one Power Point slide. 3MT develops academic, presentation, and research communication skills and supports the development of research students’ capacity to effectively explain their research in language appropriate to a non-specialist audience. This skill is critical for all graduate students across all academic disciplines. A team of judges (not from the discipline) will determine the winners. The competition will be open to both masters and doctoral students.